One of Anderson's first major scientific contributions was determining the molecular structure of several cyclitols, which are a group of compounds closely related to the sugars. It turned out to be a research area that yielded more than 800 cyclitol and sugar derivatives, most of which are the intermediates to becoming the desired end product. Along the way, Anderson and his research group purified each of the derivatives and meticulously documented and saved them, which led to a collection they held on to. 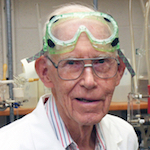 He became a world expert on the structure and chemical synthesis of cyclitols, including the inositols that proved to be central in biological signaling. To read the memorial resolution about Anderson that was read to the UW–Madison Faculty Senate, click here.